Our protagonist Evelyn Bucknow is growing up poor and a bit lost and lonely. Her family is fractured; her very young mother drifts from man to man and menial job to menial job, and a feud between her grandfather and mother has split the family even further. Evelyn and her mom live in a run-down apartment complex, and Evelyn is often left to fend for herself. This might seem easy to brush off for some people (after all, she earned her win, while Traci’s project was all style and no substance), but fourth grader Evelyn reacts horribly, and the reader is heartbroken for her in this scene as well as while she navigates middle school and high school feeling second-rate and less-than due to her background. Even though Moriarty’s writing is smooth and absorbing, don’t let the cover image fool you – subject-matter-wise, this is definitely not chick lit. Evelyn has to deal with many challenges that adults should be able to protect her from. On this point, the writing is wonderfully subtle and affecting. When her mom is suspected of an affair, Evelyn deeply worries; if there was a fight between her mom and the man’s wife, there would be a great disadvantage: “Mrs. Mitchell’s diamond ring would cut across my mother’s face, leaving blood, a long deep scratch. My mother has no rings, and would have to fight barehanded.” This illustrates yet another example of the natural, heartbreaking thinking that shows the way Evelyn perceives her place in the world. Contextually, the 1980s references add a lot to the book. Ronald Reagan’s presidency, the Oliver North scandal/Iran-Contra affair, the science-evolution debate that in some ways launched in Kansas schools, and other history-making events (along with ’80s music, style, and pop culture) are all filtered through Evelyn’s personal experiences. Since I was too young to vividly remember a lot of the ’80s, it was fun to read this perspective on my birth decade, and I can imagine that it would be a nostalgic read for those who recall these years with great detail. Evelyn’s relationships with her mom (they work at McDonald’s together at one point, back when McD’s was all the rage – another little ’80s detail I got a kick out of), her grandmother, Traci, her best friend Deena, her teachers, and the constant object of her affection, Travis, are all drawn carefully, subtly, and insightfully. You’ve just got to root for Evelyn to make it out of her impoverished, burdened life in this small-town (I’ve taught many a student that shares similarities to her), and her journey is a memorable and hopeful one. 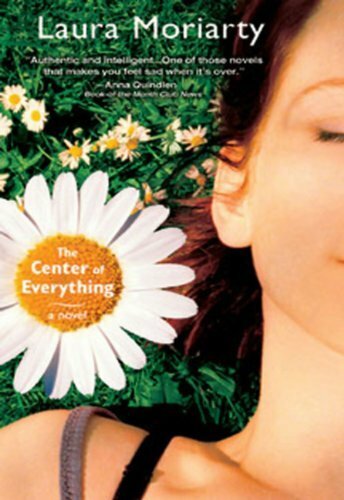 All in all, The Center of Everything is a captivating, poignant, and impressive read.